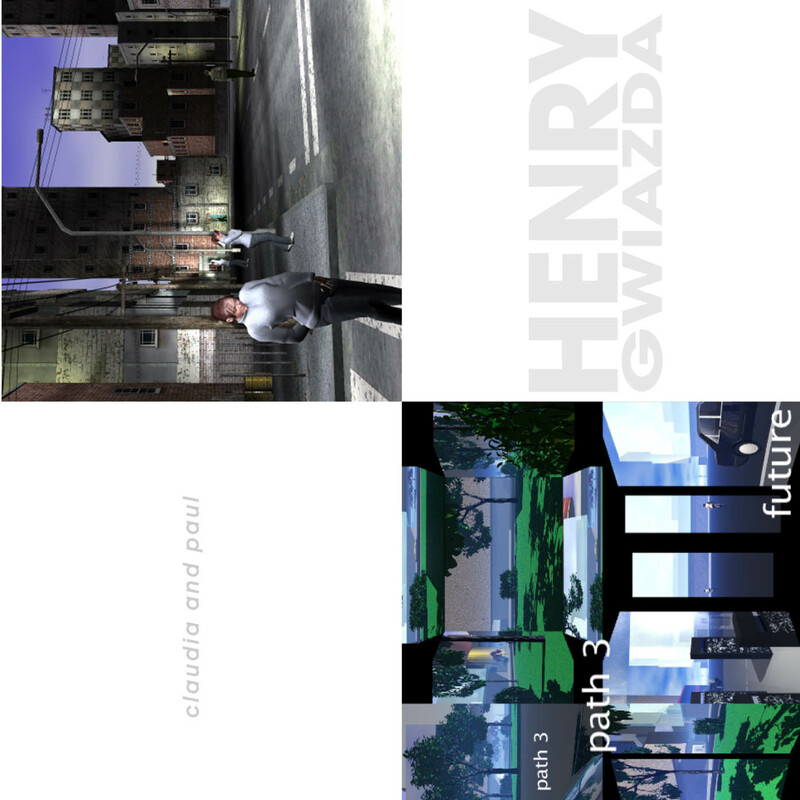 Henry Gwiazda’s world, as represented in these three new audio-visual works, couldn’t be more uneventful or normal. A lot of everyday stuff happens: characters move through an urban landscape. But the remarkable thing is in the details; every link, join, gap, and connection turns the viewer’s attention to the negative space surrounding the action, the silence between events, the rhythm of life, the blank area around these words. There is an inverted, Zen rhythm that makes you notice more; he outCages Cage. These are virtual worlds where humans, lights, text and sound conspire to shift your perspective on life and how we live in the world. Gwiazda's contemplative approach produces a new kind of multimedia choreography that is as likely to enlighten as it is to disturb. In addition to the three visual works there is the sound-only claudia and paul 2:13 a.m. audio version, which won the Grand Prize at the 2008 DIGit Media Exposition. Henry Gwiazda is a new media artist/composer whose artistic trajectory has taken him from Downtown New York to Fargo, from sampling, sound effects, and immersive technologies to his current work with integrating new media with a focus on sound and movement. Gwiazda's works are regularly screened in festivals and galleries throughout the world including New York, Paris, Madrid, Cairo, Amsterdam, Beijing, Berlin, Naples, Marseilles, Damascus, Athens, Istanbul and many others. Last year, he won First Prize at Abstracta Cinema in Rome and this year, Second Prize at the Crosstalk Video Art Festival in Budapest.